I think it’s a dream of every skater to have his own ramp at home. Sure, I have my own ramp at home. 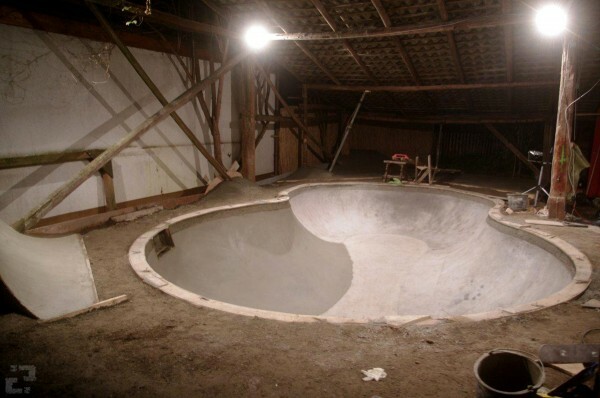 Sure, it’s a crazy big ramp, half bowl half mini ramp, etc. 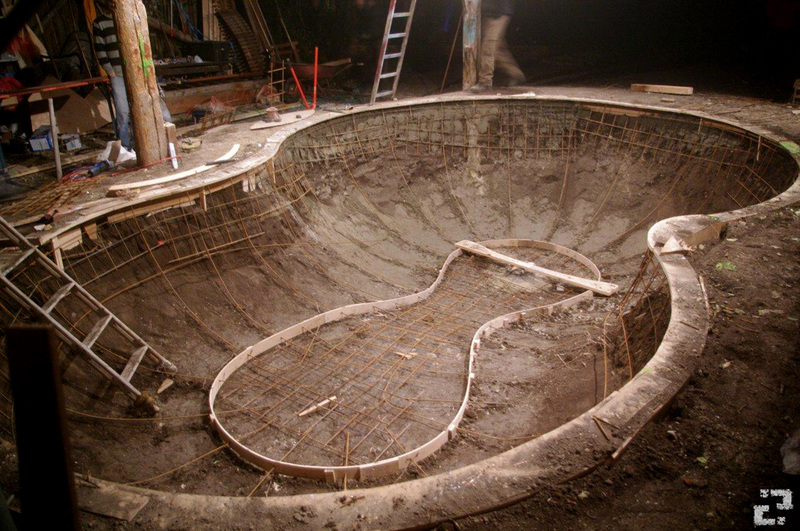 But sure its not a pool…. I have always said that I must build a pool for my daughter so that she doesn’t grow up without her own backyard pool. When we rebuilt my barn we had a lot of transitions and wood left over, so I planed to build a small ramp for Maya in my backyard in the next summer. In the middle of September, I wanted to just make some new grass in my backyard and I spoke to my uncle who owns a small landscape garden company. He said he will bring me a small bagger (bulldozer/excavator) to dig out the old stuff and fill in new earth. 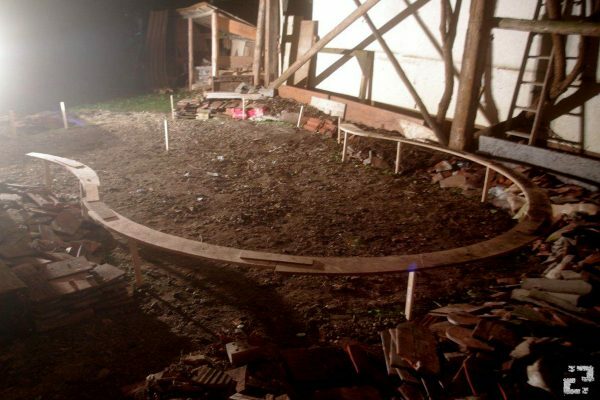 A day later – after I realized that I will get a bagger for free – I switched the plan with Maya’s ramp and decided to make something in concrete. A few days later plans grew and I also ordered a trampoline which I also want set in a hole to have it on earth level. 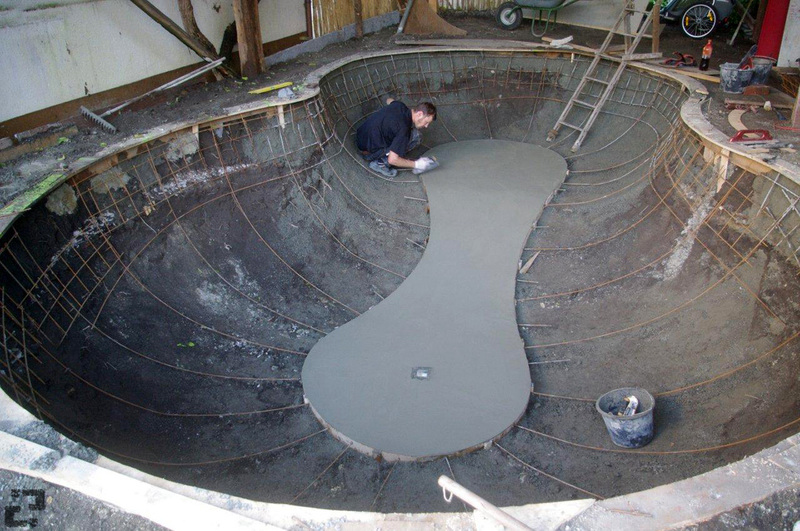 On the late evening of September 30th, we had the idea to go for a backyard pool and size the deep end diameter so that we can put in the trampoline. One day later we started to make the radiuses and found out the best position and sizes for the rest to fit the pool under the roof and between the pillars from the roof. October 5th and 6th – we took 6 hours digging to complete the hole and filled in the earth in the rest of my garden for my new grass. A friend who works in a concrete pieces company ‘organized’ us all the steel for free and we put it in and prepared everything for the first concrete. 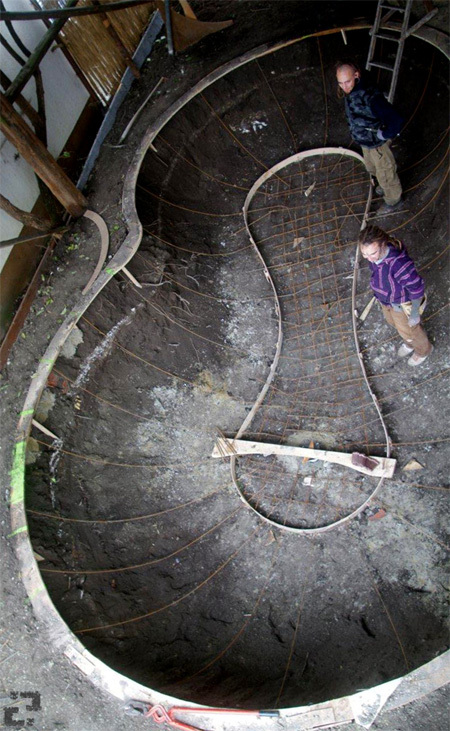 October 10th – we started with the concrete. Me and Jörg Schaller from sk8parks.de (who is a good friend and also lived in Moos and has built ramps for a long time) finished the flat and filled up some concrete in the higher sections under the steel. October 13th – just a few men go for more concrete – the plan was to make the full shallow end – at this time we were not even sure if we can handle this. At the end of the day we got 5 trailers with 2m² concrete in the pool. The biggest amount of concrete we ever have worked in one day. 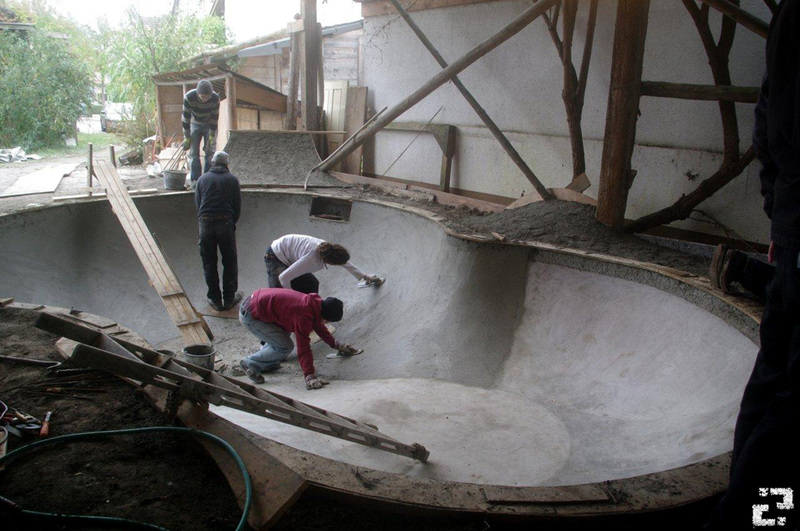 October 15th – we got a 12 man crew and the concrete truck was coming at 9.30 am bringing 2.5m² of concrete. The first time every that we got a concrete truck. And when you just work with 5-10 cm concrete strength, that is a lot of surface to finish. Also our skills and equipment are getting more and more professional. We have made a finish and shape that most companies would be proud of…. all by hand and all by skaters. 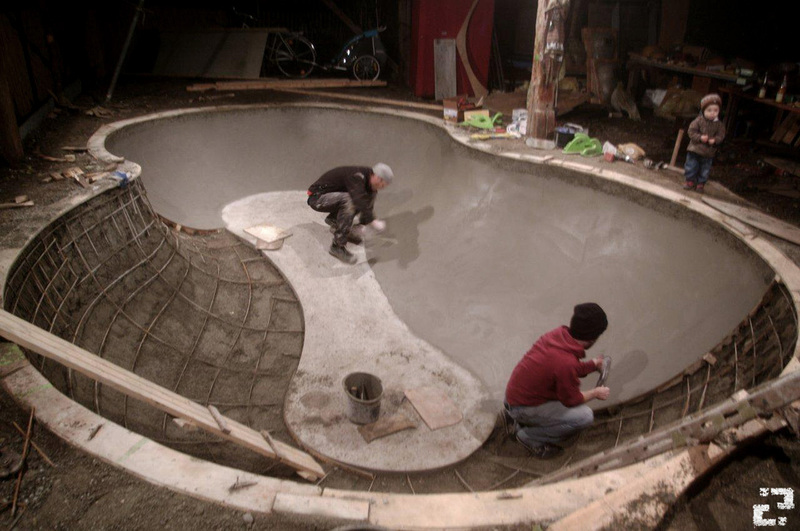 Its kind of crazy to make a pool like this in just two weeks after the idea and the planning. Dreams comes true – sometimes it happens out of nowhere. That’s skateboarding.